Jaafar Muhammad an-Nimeiry (otherwise spelled in English as Jaafar Nimeiry, Jaafar Nimeiry or Ja'far Muhammad Numayri; Arabic: جعفر محمد نميري‎; 1 January 1930 – 30 May 2009) was the President of Sudan from 1969 to 1985. Nimeiri moved on different positions in the Sudanese army. He was accused in 1955 of orchestrating a coup d'état against the country's democratic system at that time, but it was found after the investigation that it was nothing more than lacking the existence of sufficient evidence to show that he was relevant. He was interrogated again about a failed coup attempt led by an officer named Khalid Yusuf, but the investigation did not find anything to criminalize Nimeiri in the attempted coup. Nimeiry successfully weathered a coup attempt by Sadiq al-Mahdi (a religious figure, Prime Minister 1966-67 and leader of the Islamic Umma Party) in 1970, and in 1971 was briefly removed from power by a Communist coup, before being restored. During the Communist coup, Nimeiry jumped out of the window of the place where he was incarcerated when his supporters came to the rescue. After this coup, he started to move away from Soviet influence and began to receive arms from the U.S. In 1976, a force of one thousand insurgents under Sadiq al Mahdi, armed and trained by Libya, crossed the border from Ma'tan as-Sarra. After passing through Darfur and Kordofan, the insurgents engaged in three days of house-to-house fighting in Khartoum and Omdurman that killed some 3000 people and sparked national resentment against the Libyan leader Muammar al-Gaddafi. Nimeiry and his government were narrowly saved after a column of army tanks entered the city. Ninety-eight people implicated in the plot were executed. 1976 is also the year that he appointed a new governor, Abdelrahim Mahmoud, to rule the Central States (Gezira State, Blue Nile State, White Nile State). The economy was booming, due to the cotton industry in the Central State. In 1985 Nimeiry authorised the execution of the peaceful yet controversial political dissident and Islamic reformist Mahmoud Mohamed Taha after Taha — who was first accused of religious sedition in the 1960s when Sudan's President was Ismail al-Azhari — had been declared an apostate by a Sudanese court. Shortly thereafter on 6 April 1985, while Nimeiry was on an official visit to the United States of America in the hope of gaining more financial aid from Washington, a bloodless military coup led by his defence minister Gen. Abdel Rahman Swar al-Dahab ousted him from power. 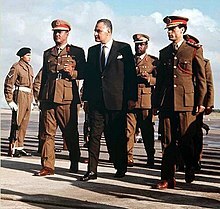 At the subsequent elections the pro-Islamist leader, Sadiq al-Mahdi (who had attempted a coup against Nimeiry in 1976) became Prime Minister. During 1980–85, the Sudanese Pound lost 80 percent of its worth due to inflation and renewed civil war. Nimeiry lived in exile in Egypt from 1985 to 1999, in a villa situated in Heliopolis, Cairo. He returned to Sudan in May 1999 to a rapturous welcome that surprised many of his detractors. The next year, he ran in the presidential election against incumbent president Omar al-Bashir, but did poorly, obtaining only 9.6% of the votes in elections that were boycotted by the Sudanese opposition and alleged to be rigged. In 2005, Nimeiry's party, the Alliance of the Peoples' Working Forces signed a merger agreement with the ruling National Congress of Sudan. The National Congress negotiated an end to the Second Sudanese civil war that was signed in a Comprehensive Peace Agreement on January 9, 2005. Nimeiry died of natural causes in his home in Omdurman on 30 May 2009. Tens of thousands turned up to his official funeral including members of Sudan's political forces that had opposed his rule. After Nimeiry's death in May 2009, former Revolutionary Command Council member Khaled Hassan Abbass was elected head of the Alliance of Peoples' Working Forces. Splits occurred amongst the supporters of Nimeiry with some endorsing the partnership with the National Congress and others alleging that the National Congress reneged on the merger agreement and did not properly implement it. The splinter groups formed the May Socialist Union which took part in the parliamentary elections in Sudan in 2010. Another group led by Professor Dr. Fatima Abdel Mahmoud set up The Sudanese Socialist Democratic Union Party as the successor party of the Sudanese Socialist Union. Abdel Mahmoud was the first woman cabinet Minister in Sudan in the 1970s, and the first Sudanese woman to contest the presidency in the 2010 Sudanese election. ^ Sudan: A Country Study "Role in Government" United States Library of Congress. Accessed on September 10, 2007. ^ a b c d e Dennis Hevesi (June 11, 2009). "Gaafar al-Nimeiry, a Sudan Leader With Shifting Politics, Dies at 79". The New York Times. ^ a b c John E. Jessup (1998). An Encyclopedic Dictionary of Conflict and Conflict Resolution, 1945-1996. Greenwood Publishing Group. pp. 530–531. ^ a b c d Diana Childress (2010). Omar Al-Bashir's Sudan. Twenty-First Century Books. p. 40. ISBN 0-8225-9096-4. Retrieved February 13, 2011.